← Be Afraid. Be Very, Very Afraid – Or Not. What is it “they” say? Sounds like hooey. 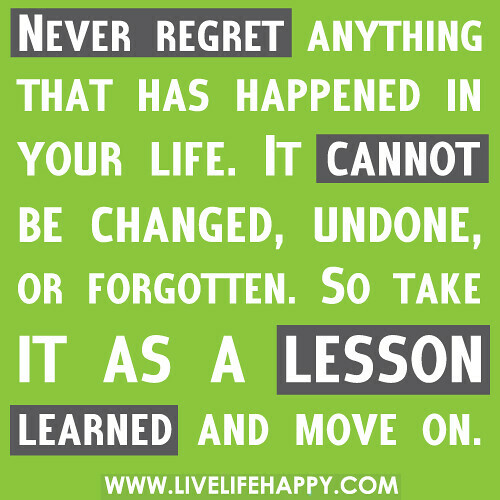 Something some fake person made up whose regrets were like blips on life’s radar. “I regret picking the blue sweater instead of the red one!! !” Boo. What’s funny about it is… dammit, that this comment is actually spot on. I was thinking about regrets. Are there things I’m doing now I will regret in the future? I don’t feel that I will. I really honestly don’t think I have any regrets. I don’t. I do feel that way now. That these choices I should have made, but didn’t- truly led me to where I am in my life today. I love this life. But, that being said…. it took me awhile to say that I completely have no regrets. 1) Trying too hard to be cool in junior high. If I had just been myself, I would have been cool. 2) Not trying out for the part of Maria in West Side Story in high school (I was convinced I couldn’t sing because of my very embarrassing Grease try-out in seventh grade… I had NO clue what I was doing, fyi, and didn’t want a repeat performance this go-round). 3) Going to my high school (instead of the rival one) and UW instead of Boston College. 4) Interviewing and getting a marketing Internship with the UW Athletic Department, then not taking it. 5) In 1996, buying a 1985 Honda Civic that broke down probably 400 times- when I should’ve taken my Dad’s perfectly running 1990 Honda Accord for free (I thought the Accord was too parental-looking). 6) Dating a guy who was verbally abusive. I regretted dating him for too long. I regretted dating him at all. The truth is, my list of things that I did do, opportunities I did take, far outnumbered the ones I didn’t… or regretted. I may have had a list of six things I regretted at one time, but I have a list of six-hundred things I am so happy I did do; incredible, life-changing things I am thankful for. Things that would’ve easily been added to my regrets list- however, I never had to, because I went for them. 1) I can’t regret trying too hard in junior high. The thing was, I wasn’t ready to be me in life- just yet. I needed to develop into that person eventually. Like most people, I was awkward, for sure. But I just copied others because I thought that was the formula to being cool. In the meantime, I was mostly invisible, and as a result, I think the experience humbled me and kept me real while figuring out who I was. If I was cool from the start, I definitely would’ve had an ego bigger than the one I have now. I became a beautiful girl later in life, and I’m glad I was a nerd until then to keep me grounded and appreciative for when I finally did blossom. 2) There was, honestly, probably a one-percent chance I was going to get the part of Maria. But I blew away everyone in the acting and dancing auditions (no joke!) and just straight up didn’t do the singing audition. I was scared. I’ve since learned to 1)be as prepared as I can be for any of these types of things- interviews, etc. and 2) If I get an opportunity at something, I just need to go for it all the way… despite the outcome. 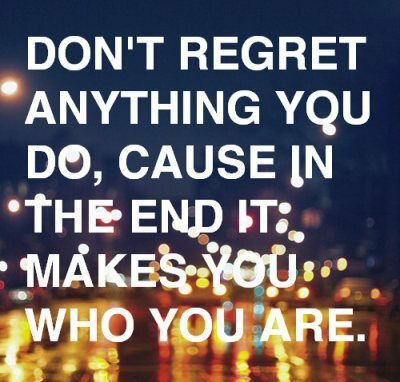 No regrets! 3) I was so upset at my parents for making me go to my high school… but it ended up being a great experience. And college? Going to a big school, the networking, connections and west coast love… it’s all been worth it professionally and personally. I figured that out years later. Bonus points: no private school loans to pay off! 4) A UW Marketing internship would have most likely led me to a job and contacts in a very visible NCAA Division I Athletic department. I do still think of that path from time to time. But what I gave up for it? A chance to study abroad in London and travel for six weeks across Europe. One of the best experiences of my life. So, I’m ok with it. 5) The Honda Civic purchase was just a dumb move. I lease all new cars now. Not the most economical way to live, but man, I love a new car every three years- and ZERO breakdowns. 6) I’m sure we all regret people we date. This guy was a doozy. I learned a lot about myself, and I learned just how little respect I had for myself at that time. I also learned how to look out for people like that in the future. One additional weird thing I took away from that relationship was that I finally understood why women who are abused have a hard time leaving that abusive person (i.e. Rhianna). It’s such a crazy insane mental warp you are trapped in… where the lows are awful, and highs are amazing… where something horrific is said followed by the most intense apologetic begging and pleading. Looking back, I can’t say I enjoyed it- and I still get pissed this guy is still out there doing this to other people- but I can’t help him. He needs to help himself. All I can do is break free and learn from it. And I have. I have appreciated every guy since then… whole-heartedly. And I can thank verbal-abuse-guy for that. If only…. I had done something differently. Taken the other choice. Made that subway on time. Never met him. You can say a million things… but those things that happened… they never go away, and you wouldn’t be in this exact place, mental space and moment you are in now- if not for them.